Now available in a larger silk screened print on sale! 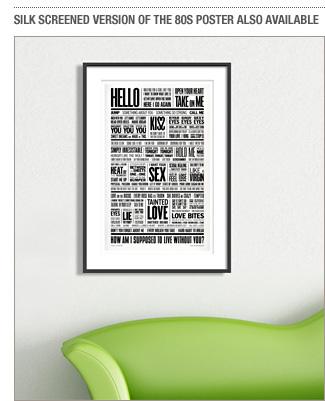 Pick up a 15.5X24 version of the 80s Love Story poster printed in black on 110 lb. French paper. 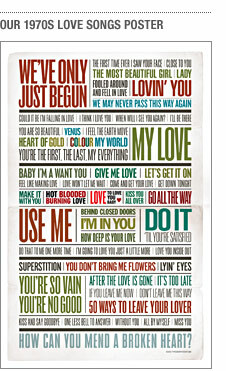 With a color scheme befitting the decade, we're happy to present the 1980s version of our Love Songs poster series. The poster tells a love story, from hopeful beginning through falling in love and the expression of its passion, the appearance of trouble and doubt, the breakup and its lonely aftermath. 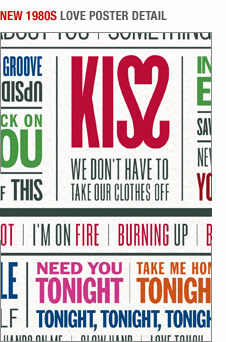 Told entirely through song titles from the 1980s, the posters have been featured on scores of design blogs and in HOW magazine. Available in 1960s or 1970s versions as well. Pick up all 3 for just $35.99. Be sure to check out our new black and white silk screened version on sale. Posters measure 11X17and are printed on 100# coated cover stock. Produced digitally via a process which rivals the look of offset. Shipped in a sturdy mailing tube.